If I was only able to hold onto one of my my pistols in a SHTF-type situation, it would be the Rex. It is solidly built (like a tank) and has good weight to it to help mitigate recoil. The Rex also jams the least of any pistol I currently own (actually, I can't even remember the last time my Rex jammed... it's just super reliable). Add to that the fact that you can add a red-dot to it and a suppressor (if your state allows them) and it's a very well-rounded firearm. Very nice pistol. I'm well satisfied with the fit and finish of this weapon. Function was flawless, have not ran it suppressed yet. Saw a review of this and decided to purchase. Awesome quality. Built to last. The most well made gun I have ever fired! I purchased a red dot and mounted it, but it turns out I really don't need it because the fixed sites are dead on accurate even at 25 yards out. Grips are very disappointing but I think the idea Arex had is that with a pistol of this quality the user is going to customize anyway, and that's what I did. Overall a beautiful piece of equipment, but double action trigger is a little heavy. 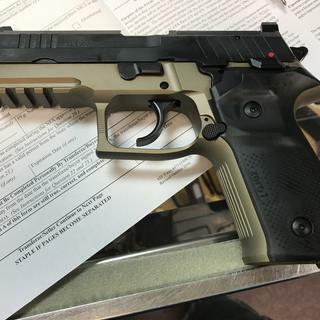 I would most definitely recommend this pistol to anyone who is looking to add a dependable tactical pistol to their family that will last virtually forever, but doesn't want to overpay. This firearm is with every single penny. This is an excellent pistol with all the high end features your looking for at a price you can afford! This is a durable, all metal, DA/SA hammer fired pistol with a lifetime warranty and exceptional fit and finish. It has a suppressor ready threaded 4.9" barrel that includes the thread protector. The frame is T7075-T6 aluminum with full-length slide rails, MIL STD-1913 rail, ambi-safety, ambi-magazine releases and a slide stop that also functions as the de-cocker. The slide is machined from solid bar stock with forward cocking serrations and is cut to accept many of the most popular pistol optics. The Rex Zero 1T Tactical is a high quality pistol and one of the best values in today's competition handgun market.